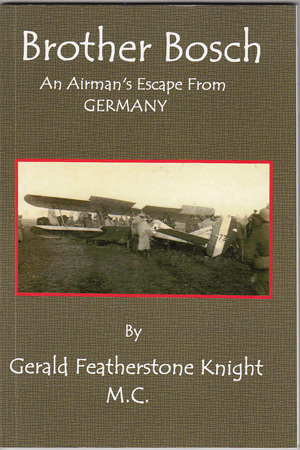 Gerald Featherstone Knight was born on 18th September 1894. Following service in the Devon Regiment during the first two years of WW1, he transferred to the RFC and was trained as a pilot. In 1916 he was transferred to 12 Squadron on the Western Front, in France, where he flew BE2c aircraft in both the reconnaissance and bombing roles. On 9th November 1916, during an air raid carried out on an ammunition dump at Vraucourt, his aircraft was intercepted and shot down behind enemy lines, where he was captured. He remained a captive in Germany for the next nine months, before escaping from a camp near Hannover and making his way on foot to neutral Holland, from where he was repatriated to England. Gerald Knight wrote and published his memoir, Brother Bosch, in early 1919, detailing his time as a captive and his subsequent adventures upon escaping. Hie died on 30th October 1919 after a short illness, aged just 25, and was posthumously awarded the Military Cross, for his efforts as a prisoner of war.